Cannoli Dip ~ Learn, Live, and Explore! Ladies and gentlemen, I think I have finally found the way to your hearts...and stomachs! The only reason I can think of why you would not love this recipe is if you hate chocolate or are cheese intolerant. 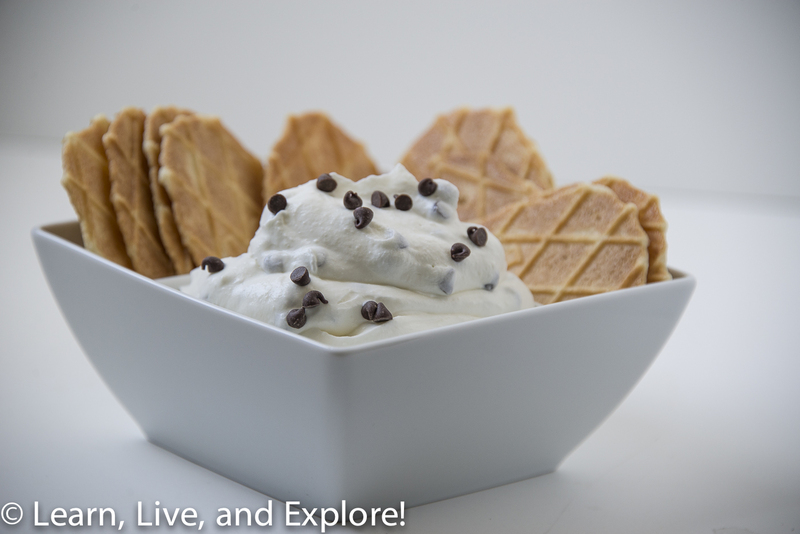 Otherwise, I strongly urge you to make this cannoli dip! Here's the best part: you can freeze it! Or put it in the refrigerator until the next day to keep the sweet deliciousness going for two days in a row! Here's another great thing: it requires no baking. If you are a cook that cringes at the thought of baking, well if you can throw a bunch of ingredients into a bowl and use an electric mixer to beat it, then you can do this. Oh, and this is perfect to bring to a party! Throw everything into a bowl except the chocolate chips. Using a hand held electric mixer or stand mixer, whip the ingredients together until it starts to get to a stiff peak stage. For those not familiar with the term, turn off the mixer, then dip a spatula in the mixture and pull it straight out, vertically. If the peak of the mixture holds its shape, you're done. Pour the chocolate chips on top of the mixture, then with a spatula, gently fold the chips in. Serve with a variety of cookies: short bread, graham crackers, waffle cone chips, chocolate wafers, etc. If it's just you eating it, spoons and fingers also work! Tip: if the ricotta you purchased has a lot of water in the package, then place it in a mesh strainer or cheese cloth over a bowl in the refrigerator overnight. I actually used fat free ricotta in my batch, attempting to be a little "healthier," so it wasn't too runny for me. Happy 4th Anniversary to LL&E! !